Summer is the season of travelling, discovering new places, cultures, people, traditions… While many adults see travelling and related activities as the best way of spending their free time, children may not necessarily share their excitement: they find sightseeing boring, the only highlights being ice-cream, local sweets and souvenir toys. Imagine you’re on your way to visit Prague or Paris and your kids are too small to be left at home or too small to get excited about the Charles Bridge or Notre Dame. Yet they’re too old to quietly observe the world from their pram in between many naps. Sounds familiar? Well, the same question puzzled Karen York who has been roaming the world throughout her entire life. 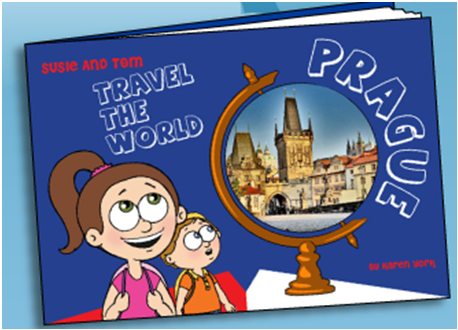 Karen York is a cosmopolitan and well-travelled author of two guide books for children about Prague (Susie and Tom Travel the World: Prague) and Paris (Little Globetrotters Visit Paris). It has been my pleasure to meet her and talk to her about her life and work. Karen, you speak both Czech and English absolutely naturally. Are you bilingual? Can you tell us something about your origin? I was born in the Czechoslovakia and when I was 8 my parents emigrated first to Sweden, and then to Australia a few years later. I lived in Australia until I was 26. When I got married to my husband Richard, we spent many years living abroad in different places thanks to his job, in Singapore, Jakarta, London and Brussels. Then we came to Prague and stayed here for ten years. Now we live in Luxembourg. Exactly. I remember my first time on the playground when we came to Sweden. I was eight then and I thought to myself: „How am I ever going to understand these kids?“ But I was still little, wasn’t embarrassed and somehow picked it up quickly. I also had a few extra classes of Swedish every week organized for immigrants by the school, so that helped. Two years later we moved to Tasmania and it was already much harder for me to learn English. I was older, more embarrassed, there were fewer teaching programmes for immigrants… But somehow I managed after all. At home, my parents spoke to me Czech all the time, we had many Czech books from exiled authors that published in Canada so I was exposed to the Czech language during my entire childhood. You have two sons aged 9 and 14. Do they speak both Czech and English? Yes, they are bilingual. My older son was born in Prague and we stayed in Prague for ten years. So my sons were growing up in a Czech environment, I spoke to them in Czech, they had Czech friends, went to a Czech school. My husband travels on business a lot so in Prague it was actually hard for us to keep their English up. Not to lose it, we enrolled them in many English activities for kids, luckily there are many opportunities in Prague. They also watched the TV cartoons in English only. How about their Czech now? You live in Luxembourg , they attend international schools… Does their Czech „suffer“? Oh, not at all, actually. Thanks to the EU institutions, there’s quite a large Czech community living in Luxembourg so we’re exposed to Czech regularly there, too. 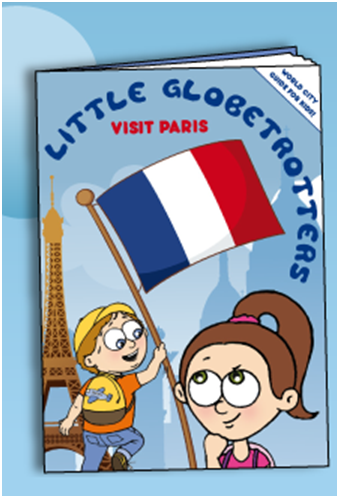 You are the author of two travel guides for children. How did the idea to write such books occur? It was then when I got the idea that it’d be great if there was a guide book designed for children, that would relate to little travellers and make the entire trip an entertainment for them. Yes, I decided to make my own guidebook for children that would relate to little travellers. A book that wouldn’t be overflowing with facts. A book that would be based on an adventurous and entertaining story to make kids enthusiastic about the place and travelling in general. And also that would later become a memory for them reminding them of the place they had visited. I also wanted to educate kids about the place in a gentle, playful manner. What about the design of the book? It’s a mixture of cartoons and photographs. Why? Photographs are important because they represent reality. But from a child’s perspective, cartoons are more attractive and children relate to them easily. I use two characters, Susie and Tom and they both have their own personality that links the entire story. While Susie is the smart and responsible one, Tom is more of a follower, a kid that finds most of the things boring and prefers eating to anything. So far you have published a guide book for Prague and Paris. Why have you chosen these cities? Well, Prague is just a natural pick: I was born here, lived here until I was 8 and later with my husband and sons for 10 years. Moreover, I love the city. Paris is another city I love, I’ve been there many times with my husband. It’s also the most visited city in the world. Do the books differ in their concept? Yes, they do. 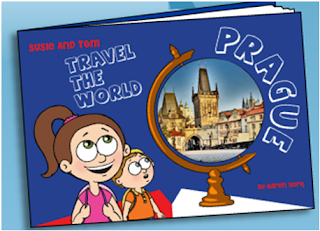 The Prague book is based on a narrative – an adventurous treasure hunt story of Susie and Tom. The city’s sights are introduced through a story filled with amusing dialogues, relating all the happenings of Susie and Tom while they’re exploring the city. When I presented the book on the Bologna Children’s Book Fair, I met a great number of professionals from the field of children literature. They liked the book and suggested to add some activities to my next books that would keep children even more active and busy while travelling. 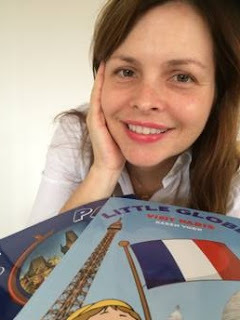 So the Paris book is more of an activity guide, filled with lots of puzzles, mazes and activities that keep kids entertained, yet at the same time make them learn something new about the city and the world in general. Which age group are the books designed for? I would say they’re suitable for children aged 6-12, or even a bit younger if parents help them with reading and the activities. I decided to set up my own distribution network so you won’t find me on the list of a publishing house. My books are on offer at many locations throughout Prague including BLUE Praha gift stores, RELAY, Shakespeare & Sons, Globe Bookstore and Cafe, Boutique Shops at the Old Jewish Cemetery, Four Seasons Hotel, Amadito & Friends, Neo Luxor and Bylo Nebylo). You can also get them via my website littleglobetrotters.net. So far, I have managed to sell over 3,000 copies. Which cities can we look forward to in the future? I studied Japanese so definitely Tokyo would be up on the list. And then other highlights such as Rome, London, Sydney and Venice where actually the entire idea evolved. Last question – what would you recommend to Czech parents that want their children to be exposed to English from early on but don’t have the opportunity to live abroad? As a start, parents could for example, let their kids watch TV programs in English or simply play them any sort of children’s music that is in the English language. The internet is a great source of information. I would only do a little with the children each day or week, so that they do not tire of it. Learning English should be fun and not a chore. Kids are like sponges and absorb new languages quickly and naturally. They are not as ashamed or embarrassed to speak foreign languages as adults might be and this is a big bonus. In my opinion, it is best, if the children listen to the English language in its ‚unspoilt‘ form, so ideally from a native speaker, so that they can hear the flow of the language as naturally as possible. It does not matter, whether the accent is in British, American, Canadian, Australian or New Zealand English, as long as it is spoken by a native. Czech parents can look up many different internet sites from any one of these countries (one example is: cbeebies.com, which is a great website from the BBC full of games, activities, songs and TV shows). Thanks, Karen, it’s been a pleasure talking to you. Good luck with all your travels! Thank you very much, for speaking with me Petra, and lots of luck with the new blog! Petro a Karen, diky za uzasne ctivy clanek!!! A.